Perfect for a couple is this 1-bedroom condo in Keystone`s Finest River Run community. Perfect for a couple is this 1-bedroom condo in Keystone's Finest River Run community. Relax in your 2 person jetted tub looking out your wall of windows to Keystone Mountain in this 1 bedroom (Queen bed) romantic hideaway. Riverbank lodge is literally on the banks of the Snake River wetlands. In the Summer, watch (and feed) the ducks and in the Winter, the whole area becomes a winter wonderland. The kitchenette has 2 burner stove, a small fridge and dishwasher and a microwave. Perfect for a few breakfasts and lunches while you're out and about. There is a sofa sleeper. 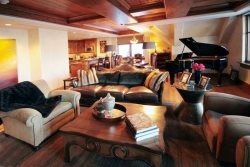 The living room has a wall of windows with great unobstructed views of the slopes of Keystone mountain, and since Riverbank is in River Run, you can easily walk to the slopes in 5 mins. The bathroom is the best feature of this condo. It has a 2 person jetted tub and stereo sound pumped in from the living room stereo and a window that opens up the living room view as you soak in the tub.